I recently found the blog elearnspace. George Siemens, an instructor at Red River College, writes the blog as part of his larger site dedicated to "everything elearning." He posts on learning, networks, knowledge, technology, and community. Last week George shared an interesting but heavy report of the Australian govenment on "Self-Directed Learning in the Digital Age." As a reader of this blog, you probably qualify as one of the adult independent self-directed Internet-fueled learners that are the subject of this study. As you click your way to learning, you may also want to check out a much smaller nugget shared by George: "E-research without discussion doesn't help." Good point. I'd like to add (as the author suggests in the actual post) that e-research with e-discussion does go a long way towards helping; and I'd dare to say that e-researching with e-soliloquizing (aka blogging) also helps, though not as much. I love Arlington but do wish it had a little more action. It's a dry town and on the fringes of reasonable MBTA bus service, so things are quiet -- except at night, when they become positively dead. Still, it's an easy bus ride from my place to Harvard Square, and things start to liven up dramatically along the way. One of my favorites on that route is a little bar called "Toad," which sits inconspicuously in the shadow of Christopher's Restaurant, right across from the Porter Square T stop. I headed to Toad with a buddy last night and had a good time there, as usual. We got there early (8pm) and it was practically empty. I brought a new card game for us to play that I found while Christmas shopping for my nephews. Each card shows a letter of the alphabet. The dealer puts down the cards one at a time until someone sees a word in the cards and yells it out. Kind of like "speed Scrabble." This was the first time I tried this game, and it was quite a hit. Not only did my buddy and I have a good time, but the ladies next to us joined in, and the bartenders took a geniune "Scrabble Player's Dictionary" out of the liquor cabinet for us to borrow. Actually, the bartenders were Scrabble ringers and they whomped us all while simultaneously serving drinks and ringing tabs. Toad has live music every night. Last night the music started at 10:30, by which time the place was packed. There is quite a variety of music. From the casual vibe of the place you expect mostly folksy or countrified rock (not my first choices, honestly). Last night was ska and I have happily stumbled upon a couple jazz bands there too. December 3rd features one of my faves, "The Pollotronic All-Stars," a Herbie Hancock influenced jazz meets mambo band. It's been a few months since I mentioned the Six Sigma Church initiative on these pages. Honestly, this is one of the juiciest projects I am involved in, and it's tempting to post on it more frequently. But with the privilege of insider-dom comes the responsibility of discretion, and so I must allow a thin veneer of historical perspective to come between real-life politics and my public posts. All that to say that this exciting project of congregational empowerment got shot down over the summer, before it even had a chance to take off. After a couple weeks of teeth-gnashing, though, our Six Sigma Squadron started smiling again when we were re-authorized with an even bigger mandate than we had started with. Now we are recovered from the summer drama and ready to fly, once again. Our mission: to lead a diverse congregation of 500 through a discussion of the role we all play in our shared ministry -- a sort of "congregational check-up." We aim ultimately to promote not just vitality and strategic thinking but also grass-roots empowerment. We have an ambitious plan to get this community-wide discussion started over the next six months. We're starting with a written survey that will broadly assess the congregational mood. Then in March 2005 we'll use the survey results to help organize a series of neighborhood meetings, run as facilitated small-group discussions. In May 2005 we'll organize a couple big town-hall style meetings to review what came out of the neighborhood groups. SurveyMonkey -- a convenient way to administer surveys. Compared to using only paper forms, we expect the combination of paper and on-line survey forms to significantly boost participation. By encouraging use of on-line forms whenever possible, we expect to virtually eliminate tedious data entry and focus purely on more interesting analyses. Results and analyses will also be available in real-time to everyone. We are also considering blogs as another on-line community tool. Bill Ives recently shared a great example of a community blog, "The uvScene." Bill also pointed me to a post by Lee LeFever about why blogs are good for running on-line communities. Social Network Analysis article in "Wired"
"Science's Next Big Score: Forget Matchmaking. Researchers should use social networks to land matching funds." By Bruce Sterling. It's a short, fun article about significant applications of serious SNA. A couple weeks ago I posted on the need for better ways to measure social capital as a function of external collaboration (or competition) between groups. Very briefly recapping, the excellent survey paper "Network Measures of Social Capital" mentions two general approaches in this area: (1) Consider each group as if it were an individual and use regular individual-level network measures. This is clean but problematic if you care who are the boundary spanners in each group. (2) Alternatively, use two-mode networks. These will keep track of different boundary-spanners but lose track of intra-group relationships. Last week the latest issue of Connections arrived at my door (Vol 26, Issue 1). (This is the official journal of the INSNA.) I was excited to see a featured article "A new measure of linkage between two subnetworks," by Peter Flom, Samuel Friedman, Shiela Strauss, and Alan Neaigus. The authors begin by explaining the very dilemma I was just lamenting, only they put it much more clearly. Then they propose a relatively simple new approach to measure social capital between sub-networks that also accounts for relationships within groups. It's a great introduction to the problem of meta-organizational networks and an excellent preliminary step in solving it. It's preliminary because their approach only works for two groups. Their approach almost cries out loud for a multi-group extension, so I encourage anyone out there with an interest in this topic to go follow up on this, and please keep me posted on your progress. I would love to hear from you. Speaking of People magazine and information diffusion (see yesterday's post), today's WSJ has a front page story about Jaye Hersh, owner of Intuition, a trendy clothing store in LA. Her little store does $5M in annual sales, largely thanks to a beautiful symbiotic relationship she has with Hollywood celebrities and the fashion press. The article opens with a perfect example of Ms. Hersh's business model. After spotting a teenager wearing white leather moccasins, Ms. Hersh tracked down a distributor and ordered 300 pairs. Then she sent a complimentary pair to Drew Barrymore. But the the key breakthrough came when sources revealed that Kate Hudson had also bought a pair from Ms. Hersh, through a friend. Armed with that information, Ms. Hersh called the style director of People magazine. Next thing you know, Ms. Barrymore and Ms. Hudson were smiling in the pages of People, showing off their footsies, and Ms. Hersh had 1,200 orders for moccasins. If you order now, your teenage daughter might get her moccasins in time for Christmas, but I don't recommend that. Connectedness is rather far behind the fashion times -- I am still debating whether to buy myself a fitted striped button-down shirt -- so we pass this story along more as an example of effective networking than as a fashion tip. Thanks to Bill Ives for tipping me off to this paper, "Information Diffusion Through Blogspace," which he describes "a scientific discussion of how new concepts spread out through blogs, and how to find blogs that matter." I took a look at the paper, very curious about the idea of measuring how much one blog matters vs another. Put this way, the question reminds me of a bit from a Laurie Anderson song, "Que es mas macho: lightbulb o schoolbus?" Or in our current context, "Which blog matters more: lightbulb or schoolbus?" And now for the answers: Laurie Anderson would have us believe that schoolbus is more macho than lightbulb. With similar authority, I submit that lightbulb matters more than schoolbus. You surely sense the shaky ground of opinion underfoot. So how do authors David Gruhl, R. Guha, Liben-Nowell, and Andrew Tomkins bring an objective point of view to this debate? By devising an algorithm to identify particular individuals who are highly effective at contributing to the spread of "infectious" topics. Sounds like a good metric to me, up to a point. I need to read more to see what the authors have to say about competing factors like numbers (think People magazine) vs authority (think Harvard Business Review). For myself, I am thinking The New Yorker, as usual. In this week's issue, my fave Malcolm Gladwell (of Tipping Point fame) writes about intellectual property and asks, what's so bad about plagiarism, anyway? He writes personally, based on a Tony-nominated play "Frozen" that cribbed 675 words verbatim from a piece he wrote. It's a great article and after you read it you will never think about plagiarism the same way again. It's also a good compliment to any discussion about information diffusion (which Gladwell points out is not so distinct from plagiarism). Speaking of information diffusion, for those of you who appreciated my review of TouchGraph, which gives a visualization of blog relatedness, I recommend you check out Bill Ives' recent review of BlogStreet Browser, which does almost the identical thing. Try them both and you will see the difference. Now that I have SiteMeter installed on my blog, I am loving the referrals feature. Each day I enjoy learning where my readers come from. Sometimes I am gratified by the recognition -- like when someone Googled the specific title of my personal favorite post. Other times it's pretty funny -- like when some did a Yahoo search on "David Ortiz married" and got this rather than our Red Sox hero's marital status. Much more often, however, scanning the referrals to Connectedness reveals a new (to me) website related to my own interests. Today's find is Social Capital, a very professional blog written by Farez Rahman. Farez is a Ph.D student in the Dept. of Computer Science, University College London, whose interests are trust models for open distributed systems, such as the Internet or peer-to-peer systems. As I dip my toes into the world of blog-networking, I am also surprised at how crude and also sophisticated the capabilities are. Sophisticated in that with SiteMeter I get quite a bit of information about where my readers are coming from. But crude in that I still do not know any way to find out when someone adds a link to Connectedness somewhere on the Internet. For a moment I thought I had solved the link survey problem, when I saw the purported functionality of the link operator on the Google cheat sheet. (Thanks to Bill Ives for cluing me in to this.) But I have since learned that the link operator in Google falls far short of revealing even most of the pages that link to Connectedness. Another way of saying this: I know when each individual net-surfer navigates to my site, and how he or she got there. But I don't know when somone endorses my site with a link, which is in some ways a much more significant action. Or is it? I am flashing back to freshman philosophy class, asking myself the question: "If someone adds a link to the Internet and no one clicks on it, does it really link anything?" A final note: All this blog-networking touches directly on TrackBack, a feature not supported by Blogger, I am sad to say. For those of you new to the world of TrackBack, here is a helpful primer. For anyone interested to know more about Howard Dean's presidential campaign (the inspiration of my recent posts), I recommend the blog eXtreme democracy, edited by Mitch Ratcliffe and Jon Lebkowsky. They define extreme democracy as "a political philosophy of the information era that puts people in charge of the entire political process. It suggests a deliberative process that places total confidence in the people, opening the policy-making process to many centers of power through deeply networked coalitions that can be organized around local, national and international issues." It was also inflated by our desire to see someone get it right, a fact that made us misunderstand the facts on the ground – we suffered the same temptations as the campaign workers to regard our fellow citizens as “definite supporters”, even when we ourselves were supporting a movement rather than a campaign. It’s been a shock, but it doesn’t have to be a fatal one. Lowering coordination costs and making it easier for citizens to create media and distributing fundraising to the masses are all good things. This year, however, to the surprise of many of us, pasting those things on to relatively traditional campaigns has worked better than the Dean campaign’s organic strategy did. The biggest difficulty for whatever version of next time comes around will be remembering not to believe our own PR. I just finished The Revolution Will Not Be Televised, by Howard Dean's 2004 presidential campaign manager Joe Trippi. My overall impressions: For those of you looking for good literature or a how-to manual, you won't find it here. But as I mentioned previously, this book is a great first-person story of the power of the Internet (and blogs specifically) to mobilize a huge community into a wave of activism. Even more than that, it's a people-power manifesto. Trippi argues that the grass-roots power of the Dean campaign, which was impossible four years ago and is still a novelty today, will be the unstoppable force of regular politics and business within the decade. So you better get ready to listen to the people, or else prepare yourself to be yesterday's news. MeetUp.com plays a big role in Trippi's story. Originally meant to bring together monthly knitting groups and Chihuahua clubs, MeetUp.com became the logistical force organizing rallies of thousands of Dean supporters all across America. Another cool site I learned about from Trippi: Sign up on grid.org and you can donate your computer's unused CPU-time to help find a cure for cancer. Wow! I will never think of screen savers the same way again. "If we are to convince the next wave of organizations and users to engage with this stuff, then we need to build on this experience and show some compelling real-world examples of online social networking in action, rather than social networking for its own sake." Joe Trippi's The Revolution Will Not Be Televised reads like a perfect answer to this plea for real-world examples; it's a story of hundreds of thousands of Americans raised off their butts by Internet-driven social networking. And it's worth noting that Trippi credits blogs specifically, not e-mail and not Orkut or some other pre-packaged social networking system, as the fundamental technology that made it all possible. I was recently visiting a good SNA wiki and discovered a link to scalefree by Anu Gupta. Anu discusses social network analysis, communities of practice, and knowledge management, and has a good list of resources. Yesterday Anu shared an introduction to SNA and why to use it, published by the Austrian consulting firm FAS.research, which focuses its entire business on social network analysis. Not long ago Anu also shared an SNA-organizational performance reading list, assembled by Wendi Backler from suggestions of the SOCNET mailing list. I am on the SOCNET mailing list myself and it's a great resource for anyone really interested in social network analysis. It's a big, talkative, and mostly academic crowd, so I do fall behind from time to time. For my personal interests, scalefree has a better signal-to-noise ratio and I am glad to have found it. The recent presidential election touched a nerve inside me. I was all set to relax this month with Dan Brown's Deception Point and Tom Robbins' Villa Incognito. But instead I am getting charged up with The Revolution Will Not Be Televised, by Joe Trippi; and I await several books by George Lakoff, including Moral politics : how liberals and conservatives think, and Don't think of an elephant! : know your values and frame the debate: the essential guide for progressives. I will surely have more to say about Trippi's book soon. As Howard Dean's 2004 presidential campaign manager, Trippi played a key role in establishing the Internet as a major force of grass-roots empowerment (not to mention candidate fundraising). Dean may have lost the primary, but according to Trippi the political map will never be the same. What the technology of TV has brought -- top-down corporatized politics -- the technology of the Internet will forever take away. Let's hope so, anyway. I'll say more about this book when I'm actually done reading it. In the meantime, I am happy to report that I finally got around to hooking up SiteMeter to my blog. This service tells me how many hits Connectedness gets and when they happen. Even more interestingly, it tells me where Connectedness readers link from. All this information could potentially be quite humbling, if the numbers are too low. So I was keenly interested to see that SiteMeter allows me to keep the statistics to myself, or to share them publicly. Though my primitive instinct said to keep the numbers private, I decided that the spirit of Connectedness compels me to share the information with you. I doubt that you care how many hits we are getting at Connectedness, but perhaps a few of you are curious where the other readers are linking from. So now you can find out. In checking my first complete day of logs, I have already discovered an interesting site I never knew before. Monitoring and Evaluation NEWS comes from Cambridge, UK and reports methods relevant to development projects and programmes with social development objectives. It includes a section entirely devoted to social networks. 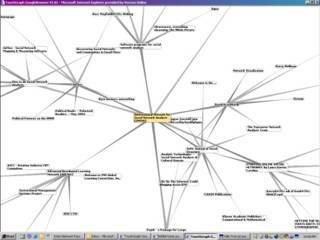 From TouchGraph there is a link to Google Set Vista by Chris Langreiter, which does something similar, but starting with names rather than URLs. Chris encourages users to enter philosopher names and see what networks come up. Imagine for a moment how these kinds of tools will evolve, and how the blogosphere will grow, and it's easy to see that existing social network software is just scratching the surface. Last Tuesday was a big wake-up call for me. Living contentedly in some of the bluest of the blue territory, I counted Bush's 2000 election as a fluke that surely would not be repeated. But by Wednesday there was no doubt that Bush belonged in the White House. Where did that leave us Massachusetts liberals? After spending a day moping over that question, I pulled myself together with an electric realization. Why are the Democrats' populist aspirations increasingly marginalized to bicoastal intellectuals? Because they are not networking strategically. Clearly a growing chasm separates Reds from Blues, and if only the Blues could bridge the gap (with the help of social network analysis, of course) then the Democrats could win back the heartland. I knew my theory rested on some big untested assumptions, so I started researching the latest demographics and other staples of the punditry. But regardless of what I was about to discover, I knew one thing for sure. There was no way the Republicans were going to win again, and I was going to use the science of social network analysis to help the Democrats take their rightful place at the top of the polls. In the famous words of Howard Dean, "YEEAAaahhh!" Maybe my work in social network analysis has a higher calling than the downfall of the Republican Party? Yes, let's keep building community, bridging between Blue and Red not as warriors but as neighbors. After reading the stories yesterday about the highest voter turnout since 1968, I did a little more research. It wasn't hard to find a site listing voter turnout (as a percentage of eligible voters) for Presidential elections since 1930. I added 2004 to the table (60% at last count) and turned the whole thing into a simple chart. 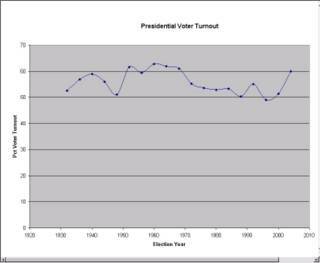 You can see that 2004 brings us very close to our highest level of voter turnout in almost a century. The other notable feature of the chart is the huge drop in 1948, when Harry Truman won reelection in a comeback surprise over Thomas Dewey. I don't know why turnout was so low that year. Though my Massachusetts address probably gives me away, I am struggling mightily to maintain a non-partisan political profile on this website. In that spirit, I'd like to celebrate the outcome of yesterday's election, which was a genuine triumph for voter participation. Specifically, a higher percentage of American voters turned out yesterday than at any time since 1968. For a collection of news stories on this angle, follow this link. If 1968 sounds too recent to impress you, then I refer you (once again) to Robert Putnam's Bowling Alone. In his comprehensive discussion of civic participation and other kinds of social capital in America, Putnam reveals an amazingly consistent trend: Across virtually all measures of social capital in America over the last century, the 1960s stand out as the peak decade of community involvement. The 60s were the culmination of a relatively steady growth in social capital that started around 1900 (with a distinct hiccup during the Great Depression); since then, just about every measure of social captical in America has declined steadily. So in terms of American social capital, 1968 sets the bar pretty high. After spending last night at Kerry's no-show "Victory 2004 Rally" in downtown Boston, I'm glad to have a little something to celebrate today. Just in case you've had your nose buried in the collected works of Ron Burt and Robert Putnam for the last two years, let me bring you into the moment: Tomorrow is election day! It's time for the citizens of America to speak. Here's hoping it's all over by Wednesday! In the combined spirit of our crazy political system and Halloween, I dressed up as the "Electoral Collage" Saturday night. 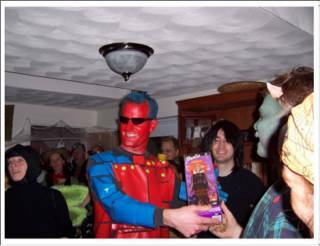 With my red face paint and blue-tinted sunglasses, many guessed I was dressed as Spiderman or some other superhero. But I polarized the red and blue patches over my body (as well as my eyewear) with the relatively serious intent of depicting our country's dire need of bridging social capital. - participating on any of the sites' message boards on my behalf Future duties may include discouraging companies and individuals from starting new social networking sites so that additional staff won't be necessary in the future. Past employment as a bouncer, "heavy", or hired goon may be helpful in this regard.